Dubai The story of a girl exploring the seven emirates and the profound changes they are going through is captured by Emirati photographer Fatma Abdullah. She has been busy lately, adding the finishing touches to her first coffee table book that aims to portray the beauty of unseen locations in the Emirates through her lens. She has chosen locations that few tourists have discovered and successfully merged the creativity of her fashion experience with her signature style. Fatma spoke to Gulf News about the experience and knowledge she acquired while working on her first book of photographs. Gulf News: What made you think of producing a book of photographs? Fatma Abdullah: The idea of publishing a photo book was tickling my mind for a long time. Last year I decided to translate my dream into reality. Frankly, I got it from my fans. They were always asking me to create some artistic photo shots and they wanted to see some traditional touches that combine a fashion photographer's view and they always wondered what the results would be. It actually took me three years to develop this book. A lot of time went into the planning phase. The photo shoot for the book started this year because I was very busy last year with my series of exhibitions and work. I also spent a considerable amount of time choosing the models for my book's characters and the search for their dresses and the study of the makeup. You know, all the details must be taken care of carefully. When are you launching it and where? I'm hoping to launch it by the end of April. At times I need to wait quite a bit to obtain permission for a photo shoot at a particular location. Thus the delay. So I'm trying my best to finish it and launch it by the end of April." Did you consult any professional editors or publishers for the book? The book will contain more than 100 photos." To whom do you dedicate the book? To my country, my fans, my family and my parents and everyone who has been helpful and supportive of my photo shooting journey for this book. Where it will be available, any particular bookstore or everywhere? I'm doing the best I could to make it available everywhere. Will it be available outside UAE? I'm planning to make it available across the world. Not finalised yet, since I have made slight changes in the plot of the story. Are there any authors of photo books you admire? I like children's story books and novels but no photo books in my mind right now. What do you think this experience has added to your photography skills? My photography experience helped me a lot to add a special atmosphere to this kind of landscape photography which is a little challenging and I'm a little bit nervous as well about how the outcome will be. What's your plan after launching the book? Well, I would like to see how it will go and maybe I will rest for a while, I hope. I'm having editorial shoots this year which I always enjoye. Editorials to me are like a genuine vacation, where I see everything and enjoy every minute of it. Have you received any support from any organisation? Yes indeed. I have received strong support from Canon Middle East. Canon sponsored me during my shooting by letting me try different kinds of lenses and offering me the new EOS 1D Mark IV DSLR camera, which I love so much. Also, Dubai Studio were very helpful by giving me permission to shoot in some areas in Dubai and also Dubai Airport. In fact, all were so kind in permitting me to shoot inside. I'm very glad that my first experience has found such great support. What equipment have you used for capturing your shots? Why did you choose them? In this book I was planning to shoot different areas of the UAE rather than fashion, which requires different lenses. So Canon offered to let me test the new Canon EOS-1D Mark IV DSLR. I chose it because I needed something which I am flexible with. The camera gave me the results that I needed such as a little bit of softness in my photos. • TS-E 24mm f/3.5 L Tilt-Shift Lens: it was great using this lens. Amazing how you can control blur and focus in the left and right, it saved a lot of artistic editing I used to do before. 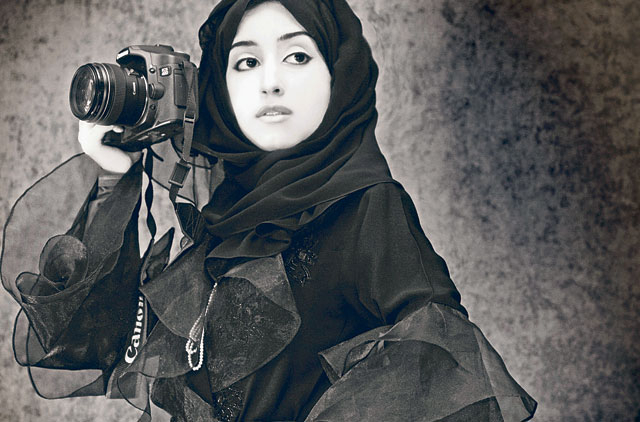 What measures do you think would help attract more Emirati women to the world of professional photography? I want them to be positive with everything. Life is difficult and it's not an easy job to be a female photographer in the first place; but nothing is impossible. Just be positive and always look at the bright side when you face a hard time and always seek for the best and the best quality, not less, and stay original.